I am always honoured and amazed when I receive an award. Once again I wish to say thank you! Where possible there are links so that you may visit the generous web sites that bestowed them. "Congratulations! Your site The Valkyrie Conspiracy has been selected for our SOTY 2008 award. This award cannot be applied for and the selection is made from our Gold and Silver winners for 2008." "It is with great pleasure, to write to you today to let you know that your site Valkyrie Conspiracy has won the Phönix S.O.T.Y. 2008 - *Site of the Year* ! Congratulations on an excellent web presentation, your creation is very deserving. Our awards are not easy to win so keep up the great work. The web site show a historically fictional story about the German resistance to Hitler. By reading about the sad historical events, you can understand the happening of the terrible history of that time. We all thoroughly enjoyed our thoughtful visit to your historical site and wishing you much success and thank you for making the www a better place to visit. "Congratulations. NAP is pleased to honor Valkyrie Conspiracy with our Gold award. Your site is a wealth of information. The design is exceptional; it surpassed our criteria in every category. Best wishes & please stay in touch." Award Sites! 3.0 Book-Look "Awards of Excellence"
"I am delighted to tell you that we have now assessed your Web site and, based on the ease of navigation, content, graphic quality, page layout and design, we have awarded you the book-look "Top Spot" award for Web site excellence. Thank you for taking part in the book-look awards and we wish you the best of luck with your Web site." "Congratulations ... Your site, Valkyrie Conspiracy, is a really very interesting and cognitive. ... Our award is a gift to you for enriching the Internet community and with no other condition ! I'm very pleased by announcing, that your site "Valkyrie Conspiracy" is a Gold Award winner of my "CLL Website Awards". Also, thank you very much for inviting me to evaluate your excellent site with so interesting and always so topical subject of Valkyrie Conspiracy and its research by historian Helena Schrader, including several useful online references! Navigation is functional, relevant and exhaustive. Pages are proper-sized with high consistency. Coding complies with high W3C standards and WAI issues. Backgrounds, fonts and graphics are well selected lending support to a harmonious whole. In its entirety your site is very pleasant to visit. ...Once again an excellent site with important and topical content with pleasant and user friendly design. You reached the highest score of my AP so far this year. Congratulations again!" "After a careful evaluation of your site from our evaluator team are I happy to say, congratulation. You have achieved our Phönix Award in gold. The web site show a historically fictional story about the German resistance to Hitler. By reading about the sad historical events, you can understand the happening of the terrible history of that time. We all thoroughly enjoyed our thoughtful visit to your historical site and wishing you much success and thank you for making the www a better place to visit. ...This is an outstanding historical site with an outstanding design, layout, and easy navigation. The web mistress Kythera Ann made a great use of graphics and text which enriches the visitors time on the site." "A well-designed web site, with easy navigation, pleasing graphics, but beyond that this site brings alive the history of the German underground and the years between 1938 and July 1944. This celebrated author has also written several other books which should also be read. A site well worth visiting." "Congratulations, You have won an award! The evaluation of your web site has been completed. Your site scored a score of 92 out of a possible 100. 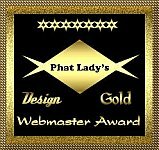 Phat Lady Lingerie is pleased to present to you Our Gold award. I feel as though this award is well deserved considering your hard work. Congratulations again for a site well done." "I enjoyed visiting your site. It is truly a plus for the Internet and consequently I would like to reward your efforts with the Gadzillion Award For Creative Thought on the Internet." "Your web site is excellent and a contribution to the World Wide Web! Your site is a great reflection of long and thorugh research into a subject. We especially liked the "informational" rather than "commercial" flavor you gave to the site. 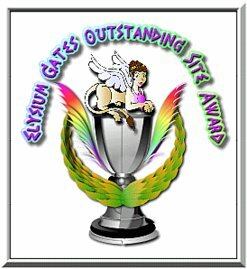 We are pleased to announce you being named to the Featured Site Hall of Fame for Elysium Gates! Your site has excellent navigation and HTML, exceptionally interesting informative articles and an attractive design. Keep up the good work. You are a great example of an excellent personal web site. Your web site is excellent and a contribution to Historia! We are bestowing upon you the honor of being named in the Featured Site Hall of Fame in Historia. Your site promotes everything that the Historia is striving to be..a group of informational pages that help inform, educate and better understand the past, created by a unique individual. Keep up the good work. You are a great example for others." "Congratulations, your site has won my "Outstanding Site Award"